We’d love your help. Let us know what’s wrong with this preview of Forbidden by Faith by Negeen Papehn. Raised by her immigrant Iranian parents, she’s been taught that a good daughter makes decisions based on her family’s approval, and she’s spent most of her life in their good graces. Until she meets Maziar, and her world is turned upside down. An instant electricity ign Sara knows her life would be easier if she married a man of her faith, but when has love ever been easy? To ask other readers questions about Forbidden by Faith, please sign up. The blurb on the back of this book does not do the story between the covers justice. Forbidden by Faith isn't only a love story, it's also the story of young woman's journey of self-discovery. Sara has her plate full: pharmacy school, loving--but demanding--traditional Persian parents and family, and two hot, forbidden men who are both willing to fight for her. The author kept me guessing and I loved not knowing how this story was going to end. Papehn also did a stellar job of depicting Sara's s The blurb on the back of this book does not do the story between the covers justice. The author kept me guessing and I loved not knowing how this story was going to end. Papehn also did a stellar job of depicting Sara's struggle to find the truth while those around her are busily pursuing their own agendas. Sara walks a fine line of being an American, a Persian, and a woman who is her own person, regardless of labels or her family's or society's expectations. Papehn tells Sara's story in a clean, fast-paced, direct fashion that is compelling without sacrificing beautiful, intelligent, and often amusing prose. "There was a warmth about him that felt like fingers wrapped around a hot cup of tea on a cold day." "Persian women were a special breed, possessing certain ironclad strength. They never showed weakness. . . . Absolutely no one considered therapy, unless they were clinically insane." And then there were the descriptions of food, which left me so hungry I was ready to gnaw off my arm. I LOVE Persian food and it was torture to read about it and have no Persian mother here to cook for me. What is one willing to sacrifice for love? Religion? Family? All of the above? Negeen's beautiful writing evokes a diverse set of emotions that make the reader understand the multiple facets of love. A beautiful debut romance by an author that should stay on your radar! Set in Los Angeles, Negeen Papehn's debut novel, Forbidden By Faith, is a modern day Romeo and Juliet. If you enjoy high stakes Romance, you won't want to miss this one! Taking one of history’s oldest cultural divides, the author — with her gifted ability of capturing the authentic tension of the moment — pushes the story into territories that are uncomfortable, but necessary. Through the many passionate escapades between lovers, the heart-wrenching anguish of a parent, and the seething outrage of intolerance — she straps you in tightly and brings you along on this wonderful rollercoaster ride. In the end, they say that love conquers all... but they didn’t say tha Taking one of history’s oldest cultural divides, the author — with her gifted ability of capturing the authentic tension of the moment — pushes the story into territories that are uncomfortable, but necessary. and Maziar,Persian Jewish.Family,religion,customs and traditions are on the way of Sara and Maziar’s love...The author magically and skillfully describes the Persian culture and values and that makes the book so much more than a love story..We find ourselves in many of the scenes..Realistic yet romantic and beautiful Forbidden by Faith is a must read! Negeen's beautiful prose takes us on a journey through the trials of young adulthood--of finding your own path and independence. Mix that with a love your family, friends, and faith cannot condone and the result is a series of triumphs and heartaches as felt through the heart of a young woman determined to find her way. This book highlights the heartbreaking conflict between people who fall in love of different religions. It's a soul-searching journey between the couple to decide if love can overcome all obstacles. A strong story that touches on many levels. Family, loyalty, betrayal, faith, all the elements of a deep read. Anyone who has ever been in this situation will appreciate this book. This review has been hidden because it contains spoilers. To view it, click here. Forbidden by faith is not your average romance, but so much more. Through the struggles of Sara and Maziar, I was given insight into a culture I didn’t know very much about. I felt the tension and the heartbreak when they had to choose between their love for each other and their families. The author weaves a web you get tangled in and creates a book you can’t put down. I highly recommend it! Sara is intelligent, passionate, devoted to her faith and family. But love doesn’t care about faith. What do you do when you are in love with someone your family is going to hate? The book starts off with a bang and I couldn’t put it down! Sara and Maziar are so touching together. Their love will melt your heart. This was such a great read and the writing is very melodic. Sara and Maziar are both Persian, and their parents and ancestors are from Iran. The problem is that Sara’s family is Muslim, and Maziar’s family is Jewish. If you know anything about the centuries of unrest in the Middle East, you know that the differences in religion is a huge deal. Turns out that it is also a pretty big deal between Persians living in California. Sara and Maziar, neither of whom are overly religious, are determined to make their relationship work. Maziar is confident than ever Sara and Maziar are both Persian, and their parents and ancestors are from Iran. Sara and Maziar, neither of whom are overly religious, are determined to make their relationship work. Maziar is confident than everything will be okay. Sara is more practical, and she has her doubts. But that doesn’t stop her from pursuing the relationship. The problems in their relationship is caused by their family members. Sara’s family is mostly accepting of Maziar, though they are not pleased with their only daughter’s relationship. Maziar’s family is dead set against the relationship, and they succeed in breaking the two of up for a matter of years. Even after Sara and Maziar are brought back together, his family won’t accept it. But, during their second chance at love, Sara and Maziar are determined to let no one and nothing come between them. FORBIDDEN BY FAITH, Negeen Papehn’s debut novel, is a very interesting contemporary romance novel. Instead of playing out over a matter of days, weeks, or months like a lot of romance novels, FORBIDDEN BY FAITH plays out over years. It also isn’t rushed or (sometimes) unbelievable, the relationship between Sara and Maziar is an authentic, true-to-life romance. And the novel isn’t just about the romance between Sara and Maziar, it’s also about their relationships between their family and friends. It’s about their lives – from school, to work, to just day-to-day life. The story is told entirely from Sara’s perspective. The reader is taken along on a journey of ups and downs as they follow Sara for multiple years. The novel begins on the night that Sara meets Maziar when she is a 24 year old graduate student. The novel ends a few years later – after Sara is done with school and embarking on the next stage of her life. Sara is a very likeable character – though she does seem to cry a lot. The reader will feel her struggles as she fights for her relationship with Maziar. The reader will also feel for Sara as she finds her independence and begins to break from the expectations placed upon her by her family. Her parents expect Sara to be a good Persian daughter by following their dictates. Until she meets Maziar, she has based nearly all of her life decisions on what her parents would approve of. Dating a Jewish man (even if he is also Persian) is definitely not something that her parents would approve of. Dating a Caucasian Christian during the years where Sara and Maziar are broken up upsets them even more. Sara wants her parents’ approval, but she also wants to live her life as she wants to. Watching her grow and assert her independence and dreams for her life are captivating. The readers will definitely find themselves cheering for Sara during her journey. I thoroughly enjoyed FORBIDDEN BY FAITH. The romance between Sara and Maziar was realistic and, at times, heartbreaking. As is her relationship with her parents, brother, and friends. All of the various relationships fills the pages of the novel and help shape Sara as a person. The novel is very well written, and the characters are all fully developed. I can’t wait to see what is next from Negeen Papehn! Romance novels are uncharted territory for me, but this book made me so glad I decided to do some exploring. I was hooked from the first few pages! The writing style was lovely and easy to read. This was a wonderful debut, and I can't wait to see more from Negeen Papehn. I've read Forbidden by Faith a while ago but I needed some time to process it because I've never experienced what I did when I was reading this book. This is the first time I've hated the beginning of a book but ended up loving it. I usually waste no time DNFing when it happens but I was stranded in the country with my family and no wifi, I was in a MAJOR book slump and I really wanted to read this story because the topic is so interesting. I love when books break the usual romance structure, I really enjoy reading romance books about troubled relationships, I know some people prefer to read about the process of falling in love but sometimes it's refreshing to read about a couple fighting for their relationship to work and dealing with external stuff. I loved the Spiral of Bliss series by Nina Lane for example, it was SOOOO good but I digress. When I started Forbidden by Faith I thought that it was such a shame that this book had the potential to get me out of my book slump but that I just HATED the writer's style. It starts with Sara and Maziar meeting at a party, nothing wrong with that, but I didn't like the fact that the narrator was telling us about the beginning of their relationship rather than showing it. I also hated how absent Maziar seemed. I didn't know if it was on purpose, I had no idea how I was supposed to feel about him but I was pissed at him because he seemed super passive especially when Sara met his family for the first time. I wanted to shake him during that moment, I was super frustrated by the lack of his POV because it made him seem weak and indecisive. I think that's when I seriously considered DNFing, but I remembered that I was bored and had no wifi and I needed to know what happened next so I guessed it was a good sign. I really don't want to spoil anything but I'm really happy I continued, it's already one of my best 2018 reading decisions. What was interesting here is the fact that both characters were Iranian but with a different religion and it was enough to create tension realistically. I knew it was probably the only romance book about an interfaith relationship I would get this year, so I decided that was going to try to get into it and Maziar decided he was going to SHOW UP big time for his girl and it was AMAZING guys. He stood up for her, loved her fiercely and gave me all I needed and more. I also loved that Sara never waited for him to get there, she lived her life, grew as a character, I was pleasantly surprised by both characters growth. It was beautiful to see them realize what was really important for them, what they were willing to compromise with and what they couldn't sacrifice in order to be content with their life. It was surprisingly inspiring to be honest, I didn't expect to learn so much from this book even though it was obvious from the start that it was an important story to tell for Negeen Papehn . It's her culture and it was loosely inspired by her relationship with her husband. I decided to write this review to support this author because I really want more story representing the USA's different cultures. It's a shame that this diversity that makes this country so interesting is barely represented in this genre. I definitely enjoyed it and ended up rooting for the couple and their love. It was entertaining and thought provoking enough to keep me engaged until the end. Forbidden by Faith still has all of the flaws you can expect from a first book but at some point I just let go and started to really love it and I can honestly write that I don't regret finishing it and would recommend it to anyone who enjoy reading romance with characters of different religious, cultural or/and racial background. Give it a chance, I promise you won't regret it ! Interesting look at cross-cultural romance set in America. This book has me hooked from the very first sentence! The characters were endearing and the story was refreshing and original. This was a lovely read! A romance made more interesting than most because of the cultural and religious obstacles in the way of love. I have to wonder how many relationships last the decades when extended families are not interested in staying connected because of an incoming (possible) in-law with a different background. Papehn deals with many of the situations that could occur in this romance that's only on-again, off-again because of family pressure and bigotry, and she rides us through it all to a satisfying end. A BOOK ABOUT TWO IRANIANS FALLING IN LOVE???? AND IT DEALS WITH THEMES OF RELIGION AND FAITH WITHIN THE IRANIAN COMMUNITY?????? DID SOMEONE DECIDE TO MAKE MY WILDEST DREAMS AND FANTASIES COME TRUE??????????? Papehn writing style was the first thing that struck me: she's telling a story, not leading you through it. In a world where "show don't tell" is hammered into any writer's skull, I was surprised and intrigued by this shift. At first I thought I wasn't going to like it... and then I found myself unable to put it down. There is something entrancing, seductive -- yet at the same time no-nonsense -- about the way this story is weaved. I found myself identifying with the main character Sara on WAY t Papehn writing style was the first thing that struck me: she's telling a story, not leading you through it. In a world where "show don't tell" is hammered into any writer's skull, I was surprised and intrigued by this shift. At first I thought I wasn't going to like it... and then I found myself unable to put it down. There is something entrancing, seductive -- yet at the same time no-nonsense -- about the way this story is weaved. I found myself identifying with the main character Sara on WAY too many levels, and her story had me thinking about it for days afterwards. There's just something about it that gets under your skin -- in the best way possible. The pacing was really spot on, and no-nonsense in giving you exactly what you needed, while still teasing you with what happened next. The characters really had me enthralled (only a moment here or there where I didn't quite understand the level of emotional reaction), and I felt really connected to the main protagonists. Each character really developed into feeling "real," even if I didn't understand every aspect of them. I can't speak to the cultural representation, but I understand this story is OwnVoices. That being said, I loved getting a glimpse into Jewish and Muslim Persian culture and the tensions that exist therein. And the food!!! I received a free eBook from City Owl Press in exchange for an honest review. I was drawn to the story from the excerpt, since it mirrored my own life somewhat. The story centers around two young couple, who although are of similar backgrounds, come from different religions. Maziar is Jewish and the Sara is Muslim. Both are Iranian. Neither of the two are very religious, but each hold customs that they were raised with. The main obstacles are the family members, who become unbending in their belie I received a free eBook from City Owl Press in exchange for an honest review. The main obstacles are the family members, who become unbending in their beliefs that a union between the couple just can't happen. Most of the beliefs are caught up in old traditions. The conflict between the families breaks the couple up. Sara and Maziar, both go on trying to forge their lives without one another. It is painfully clear that no matter how much they may tell themselves that they can't be together, their hearts have something else to say. Just as Sara is to begin a new life with Ben, she gets an unexpected call regarding Maziar. She makes a decision that she knows will have dire consequences and an unknown outcome, but follows her heart. Sara is a Persian Muslim, f Forbidden by Faith is a New Adult coming of age story with several twists, giving us a modern Romeo and Juliet tale where religion, culture, and class prejudice act as the hurdles for our lovers to overcome. Told in first person from one perspective throughout, author Negeen Papehn shows us the inner world of first generation Iranian Americans, and the cultural challenges they face as they navigate the divide between different religions and generational preconceptions. When this book slid into my scope for possible review, I got really excited. 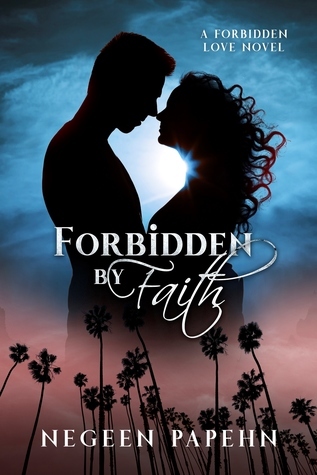 I'd just come from a conference where diversity in romance was a hot topic, and FORBIDDEN BY FAITH was exactly what I was looking for to feature on our blog. I wasn't disappointed, though this book rides a fine line between women's fiction and romance. Sara is a grown woman, working through the rigors of post-graduate pharmacy school. While she was born in the US, her parents are Iranian immigrants with their own tragic love story. She's been raised on the Iranian Muslim traditions of her parents and her mother's extended family, though she doesn't consider herself religious. When she meets Mazier at a party, she has just one question for him, "Are you Jewish or Muslim?" Mazier's family is unwelcoming to Sara, to say the least. Downright hostile would be more accurate; and ultimately, they cause enough friction between the star-crossed lovers that Sara can no longer take it, and she walks away. Enter Ben, the calm, solid comfort of friendship from a fellow pharmacy student, just when Sara is trying hard to get over her broken heart - this section of the story is what leads me to place the whole book in the women's fiction category. Ben and Sara have a relationship that evolves from friendship to lovers with a future, but that bond takes hit after hit when Mazier shows up unexpectedly from time to time, ripping open all the barely healed wounds in Sara's heart. Ultimately, tragedy strikes and Sara is forced to choose between the two men she loves and takes on a battle she expects she'll never win. FORBIDDEN BY FAITH is a debut novel, and ultimately, that shows in the writing style - long descriptions, awkward dialogue... But in the end tally, this is a book worth reading, especially because of the intimate look inside other cultures, other religions, and the ugly face of deeply ingrained prejudice. This long, winding story, contains deep, well-developed characters living real-life struggles. I'm already looking forward to reading the next book this author puts out. A special thank you to the author, Negeen Papehn, for a copy of the book in exchange for an honest review. Sara's life would be easier if she married a man of her faith, but when it comes to matters of the heart, when has love ever been easy? Raised by Iranian immigrants, Sara was raised to always respect her parents and their values. She has always made decisions that her family has approved of, that is until she meets Maziar. The two share an instant attraction and it seems like fate when she le A special thank you to the author, Negeen Papehn, for a copy of the book in exchange for an honest review. Raised by Iranian immigrants, Sara was raised to always respect her parents and their values. She has always made decisions that her family has approved of, that is until she meets Maziar. The two share an instant attraction and it seems like fate when she learns that he is also Iranian. It's too good to be true—Sara is Muslim and Maziar is Jewish. Despite their cultural and religious differences, Sara and Maziar fall in love, but their love comes at a high price because it comes at the expense of losing their families. I was so thrilled when I heard from Negeen asking me to review her debut novel—the synopsis was intriguing and I loved the cultural twist on this love story. Papehn's writing was engaging, while not being overly stylized or trite. She captured the emotions and struggles of young love against the cultural constraints of differing religious backgrounds. Sara is the daughter to traditional, albeit demanding, Persian parents, a student, and a girl trying to navigate through a relationship that challenges her upbringing. She is also American and wants to fit it, but she also wants to stay true to her culture. What I liked most was the growth of Sara over the course of the narrative. She experiences tremendous progress to become her own person outside of her family. You‘re probably gonna hate me right now, but this is not the first time I don‘t like a much loved and well rated book. Why only 3 stars though? Well, I‘m not really a fan of the author‘s writing style. The whole story seems super rushed, with basically every chapter beginning with „A few weeks passed“. The heroine meets her lover, gets to know him, falls in love with him, breaks up with him and gets a new boyfriend in 50 pages. That says it all, doesn‘t it? I like stories where I feel like I‘m par You‘re probably gonna hate me right now, but this is not the first time I don‘t like a much loved and well rated book. I like stories where I feel like I‘m part of the story by being a silent observer. But I can‘t feel like that when there are only one or two pages about a current situation and then the story goes on to a situation a few weeks or even months later. Also the story started in present tense but changed after one or two chapters in past tense, which didn‘t make sense at all at this point. Negeen Papehn was born and raised in southern California, where she currently lives with her husband and two rambunctious boys. She wasn’t always a writer. A graduate of USC dental school, Negeen spends half of her week with patients and the other half in front of her laptop. In the little time she finds in between, she loves to play with her boys, go wine tasting with her friends, throw parties, Negeen Papehn was born and raised in southern California, where she currently lives with her husband and two rambunctious boys. She wasn’t always a writer. A graduate of USC dental school, Negeen spends half of her week with patients and the other half in front of her laptop. In the little time she finds in between, she loves to play with her boys, go wine tasting with her friends, throw parties, and relax with her family.